Discipline in the Global Economy? 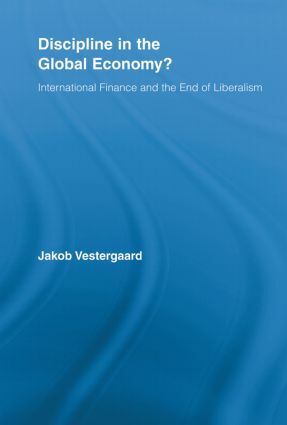 In Discipline in the Global Economy, Jakob Vestergaard investigates the currently prevailing regulation of international finance, launched in response to the financial crises of the 1990’s. At the core of this approach is a set of standards of ‘best practice’, ranging from banking supervision to corporate governance. Vestergaard argues that although these standards are presented as ‘international’, they comprise a norm for the ‘proper’ organization and regulation of economies which is intimately related to the Anglo-American model of capitalism. With this approach to the regulation of international finance, previous deregulation policies were replaced by a comprehensive system for the global disciplining of economies. This is a remarkable, if not paradoxical, occurrence in what is allegedly the heyday of neoliberalism and ‘free market economy’. Moreover, this mode of international financial regulation has proved ineffective, if not counter-productive, in terms of its objective to enhance the stability and resilience of the international financial system. Only by abandoning ‘laissez-fairy tales’ about liberalism may we begin to understand our present predicament– and open a space for critical thinking on modes of international economic governance that are at the same time more conducive to financial stability and more in line with the ethos of liberalism. So What is a ‘Proper’ Economy? Part III The End of Liberalism? So is This the End of Liberalism?